I have been on the subject of pricing misunderstandings for the last few days and another incident worth sharing occurred with a car body repairer that we were speaking to. Car body shops that invoice insurers for crash repairs are highly suited to factoring, the nature of the papertrail for each transaction means that the funders, though specialist, can offer very high levels of prepayment i.e. 100% in some cases. This means that the garage gets the full value of the invoice, less the funders fee. Typically the fee can be 2 or 3 percent of the invoice value. Hence the customer receives say 97% to 98% of the invoice value immediately, as a one off purchase of the invoice. We spoke to a car body repairer who had been looking at our website, and had seen that as brokers we receive a commission from the invoice finance company. The commission is paid by the funder, NOT the customer and is typically about 10% to 15% of the overall charges. So you will NOT receive an invoice from us. We make this clear on our site to provide transparency. In some cases the commission is only paid in respect of the service charge element of the fees, so that can be a bigger percentage of just that element of the fee, however with nothing paid against the other fees it still works out to about the same percentages of the overall the costs. We also state that we will disclose any commission payable if requested by our customer. In most cases customers don't even think about commission as they are getting a cost saving that they have not been able to find themselves. In this particular case, the repairer opened the conversation with "I'm not paying you 15%", having incorrectly assumed that we would be receiving 15% of their invoice values as a commission (having read but misunderstood our terms). The commission is not a percentage of the invoice, it is only a percentage of the fee or fees charged. 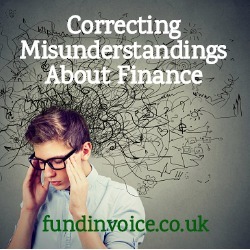 Of course we explained this, and that obstacle was overcome, however it demonstrated another misunderstanding surrounding the pricing of facilities, and how invoice finance commissions work. It is also worth noting that in many cases the fee offered to a customer by a lender is not reduced if they go direct to the lender, and even in cases were the commission is added to the fee quoted, we pride ourselves on being able to find cost savings for clients - that they have not been able to find themselves. Our recent review showed that we had saved clients looking to save on invoice finance costs, an average of 34% of the fees they had been quoted elsewhere, so the inclusion of a commission for the invoice finance broker is already included in the cost savings that we find.